type 1 pure Gold 10 gram Coin. C.M.C. started striking these Coins in the latter part of 2010. 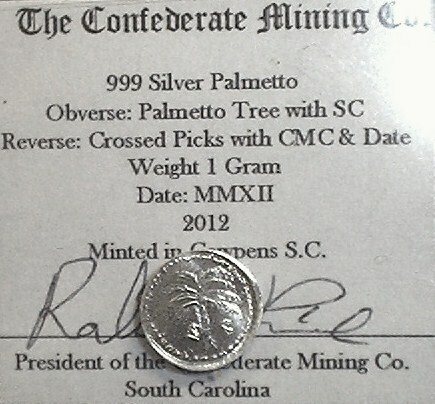 The obverse has a Palmetto Tree disign like the very early South Carolina militia buttons. 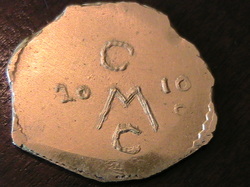 The Reverse has the letters CMC the date 2010 and a small c mint mark for Cowpens S.C.
With record high cost of Gold C.M.C. started producing type 1 Coins in Silver, Copper and Silver Alloy. This allowed anyone a chance to own a C.M.C. Coin. The newest size and weight for C.M.C. 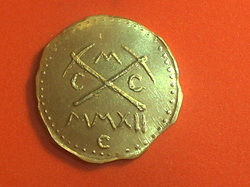 Coins is the 15mm 2012. This coin will be struck in Gold,Silver,Brass and copper. The 2011 Rising Sun is a true symbol of the South. The Coin is 999 Silver with one gram of pure Gold through it. When the Coins are struck the Gold and silver are locked together forever. This Coin has a final mintage of only 21 struck. This is the Coin to make the centerpeice of a rare collection. Januay 2011 the Die was cut for the new type 2 coin. The new coin would have a different Palmetto Tree on the obverse and the crossed picks with the letters cmc and the mint mark on the reverse. 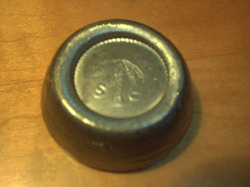 The crossed picks is the logo for C.M.C. The Coins are struck in Gold,Silver,Copper and Silver Alloy. The Coins are hand struck the same as the type 1 2010. 2012 will be very different for C.M.C. Coins. Each weight will have a different design. This will be the first year for the 4.4 gram Gold Coin. The 4.4 gram wil be 15 mm across. 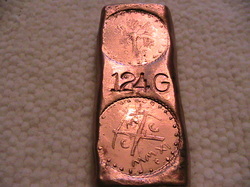 The 10 gram will have a Obverse design like the S.C. Militia buttons used during the war between the States. 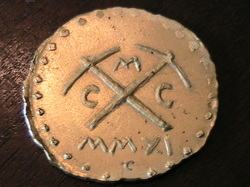 The 10 gram reverse will have our logo and 2012 in Roman,Egyptian,Greek,Arabic and Etruscan. The 20 gram Gold Coin will have a Palmetto Tree With a Snake climbing it on the obverse. This was used by the Palmetto Guard in South Carolina during the war between the states. The Reverse has the crossed picks with CMC the mint mark c and date.The 10 and 20 gram Coins will be struck in Gold,Silver,Copper, and Silver Alloy. NOTE tHE 2012 PALMETTO GUARD COINS REVERSE DIE #1 (PICTURED)IS A PROTO TYPE AND HAS BEEN CHANGED(DESRTROYED). MAKING THE FINAL MINTAGE OF DIE #1 EXTREMELY RARE. 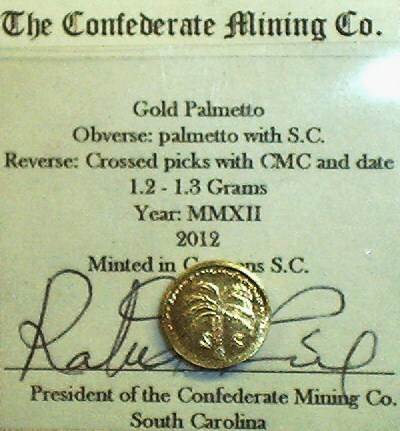 2012 PURE GOLD S.C.MILITIA 10 GRAM size 25MM.